Nicky Brett won another English title. Local bowlers returned empty-handed from the English Bowling Federation men’s and women’s indoor finals at Newark. 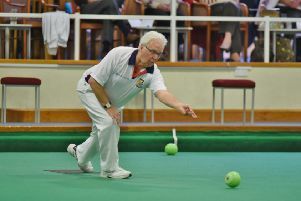 They reached just two semi-finals, both in the senior singles via Martyn Dolby and county women’s president Joan Robinson, and mustered just four victories on the green in the 12 events, three of them achieved by the women. With the championships bristling with past and present internationals at both senior and junior level, some of the local hopefuls were confronted with tough hurdles to climb. Nick Wilkie and Joe Randall in the pairs for example drew world indoor singles champion Nicky Brett in the opening round, and the world number one from Yaxley, with his partner, Lindsay Swannell, went on to lift the trophy for Hunts. They beat Northants 20-13. Dolby, who qualified in three events, had a comfortable 21-5 victory over Derbyshire’s Brian Shepperson in the opening round of the veterans singles, but was then beaten 21-17 in the semi-finals by Dave Adams (Notts) after leading 8-2 and 17-11. He had no joy in the two mixed events with Chris Ford, another hat-trick seeker, who were joined inthe triples by Adam Warrington – they lost 21-11 to Derbyshire in the pairs and 19-13 toNorthumberland in the triples. Ford did guide Jan Want and Shirley Shuffling to a first round victory in the triples – 27-14 against Humberside after recovering from being 2-10 down at 10 ends – before crashing out 28-5 to the eventual winners from Derbyshire, who were winning the title for the fifth time in seven years. Joan Robinson was beaten 21-15 in the first round of the open singles by Jenny Humphries (Notts), the eventual champion, but made it through two rounds in the senior category. First she defeated a North Cambs opponent 21-6 and was then given a walkover by Suffolk’s Shirley Plummer. But her title hopes were ended at the last four stage when she lost 21-13 to Norfolk’s Melanie Haylett, who went on to win the final. The other victory was achieved in the women’s pairs when Fiona Richardson and Julie Masters scored a last end treble to pip Durham 14-13, but they hit the buffers in the second round, going down 25-2 to the strong Derbyshire pairing of Karen Chapman and Pauline Marples. Open men’s singles first round: Derek King lost to Jonathan West (Lincs) 21-7. Under 25 men’s singles first round: Stephen Harris lost to Jonathan West (Lincs) 21-20. Men’s triples first round: Stephen Harris/Cliff Watson/Peter Edwards lost to Derbyshire 29-6. In the one-day team double rink events for county officers and presidents, past and present, Northants women finished ninth out of 12 in the Harry Carver, while the men were seventh of the 10 counties competing in the Eversley Trophy. Since reaching the Middleton Cup final in 2010, Hunts men have failed to qualify from the group stages in the inter-county competition and so will be hoping to put that right this season. They had high hopes of qualifying last year from a group containing Cambs, Beds and Herts, especially with two of the three matches at Parkway, but it proved a disappointing campaign. They have the same opposition this time, although the fixtures are reversed. MIDDLETON CUP FIXTURES: Saturday, June 4 – away to Cambs; Saturday, June 18 – home to Beds; Saturday, July 9 – away to Herts. In the women’s equivalent, the Johns Trophy, there were signs towards the end of last season that the squad was becoming more competitive, as the younger players in particular gained more experience. JOHNS TROPHY FIXTURES: Saturday, June 4 – home to Northants; Saturday, June 11 – away to Norfolk; Saturday, July 2 – home to Herts; Saturday, July 9 – away to Beds. This season’s Hunts county finals are scheduled for Yaxley, home green of the county president, Freda Thomas, on Sunday, July 31 .